Don’t miss this first public screening! 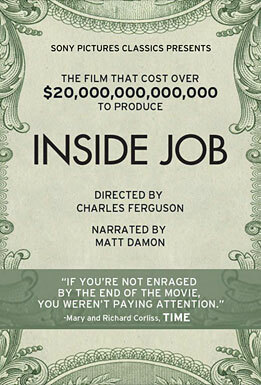 INSIDE JOB is the first film to expose the shocking truth behind the economic crisis of 2008. The global financial meltdown, at a cost of over $20 trillion, resulted in millions of people losing their homes and jobs. Through extensive research and interviews with major financial insiders, politicians and journalists, INSIDE JOB traces the rise of a rogue industry and unveils the corrosive relationships which have corrupted politics, regulation and academia. Dr Alan Bollard, NZ Reserve Bank Governor, will comment briefly following the screening.